The strength and deadliness of Mombot’s toes have been detailed in her character’s bio since the beginning of JEFbot, but I haven’t addressed it in the comic strip proper until now. This isn’t one of those things I’ve made up to be funny or exaggerated for humor: In Real Life my mom’s toes could be considered deadly weapons, and woe be to the child that has misbehaved while in close proximity to her bare foot. I have a birthmark on my stomach that I suspect may be a deep bruise from a time when I was on the receiving end of her grasping toes and raptor nail when I was a young boy. It may just be a phantom pain now, but sometimes it wakes me in the dead of night, and I clasp my hands to it, stifling a scream. and i was just watching Jurassic Park the other day, DJ, and for the most part, the effects still hold up. probably because they did a mix of CGI and practical FX, which just makes it more “real” than the pure CGI monsters they create nowadays. God, I love Jurassic Park. Its weird, when I stop and think about it, I can’t really come up with good points I can talk about with that deep, shining-eyes, nerd conviction, and I feel that in so many respects the book(s) are so much better….. But I still love that movie to death! Which is why I approach the unveiling of Jurassic Park 3-D with trepidation…. If they do it like they did The Lion King I will be a happy girl, because (shhh! Don’t tell anyone!) I actually kind of felt it enhanced the experience of the film….. But I fear it will be too gimmicky. And I have been first in a looooong time. Im usually asleep when you post the strip. i’m going to sleep right after i finish replying to this comment! g’nite. zzz. ROFLMAO! Jurassic Park is awesome. it is indeed, Insectoid! the movie and the book! agreed: while i respect the fact that Crichton popularized the idea that birds evolved from dinos, the science isn’t all that accurate, Read. funny how he tried to correct some of those mistakes (like the T-Rex’s sight being movement-based) in the horrible sequel, The Lost World. you should definitely give it another try, Insectoid, as it’s a fun read with lots of cool stuff that wasn’t in the movie. actually, have you tried reading it since you’ve seen the movie? i bet it makes a lot more sense. 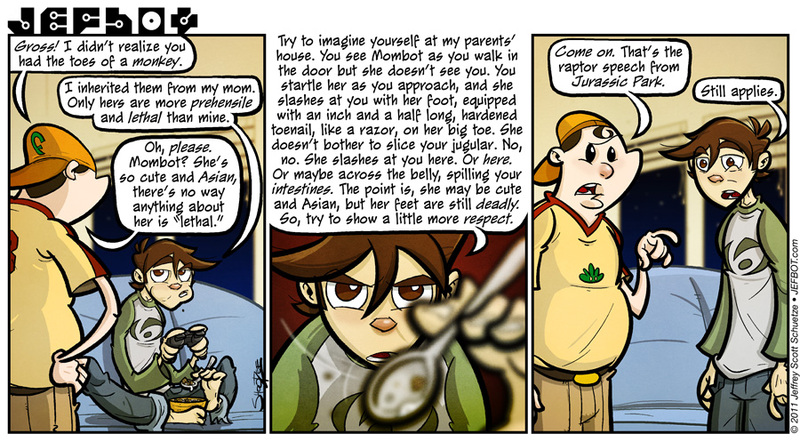 I need to use the raptor speech more often in real life. i approve, smashing0. it actually fits more occasions than you’d think! I actually remember reading that in Mombot’s bio and thinking it was just to see whether anyone was actually paying attention. Now I know it wasn’t just frivolity. Should I be scared? My best friend growing up was from Taiwan, and the moment I read “She’s so cute and Asian, there’s nothing about her that could be ‘lethal,'” I just shook my head and waited for it. ha! good analogy, Sarah W. you gotta keep an eye on Asians – especially the cute ones! This strip kinds of reminds me of my mom whose nails are always looong. I wonder how she does that considering she does all the housework. What is it with moms and their nails? Oh! And, dinos are AWESOME (like mothers with deadly weapons like their sharp nails). rawr. not sure what’s with moms and their nails, LordCheeseballs; my mom gardens, plays guitar and cooks with long nails you’d think would just get in the way! Wow. This is so awesome! I love Mombot even more now than before. Go Mombot! May I sit at your feet and learn from your prehensile, raptor toes? My kids don’t fear me enough. i completely concur, T: women are always dangerous! but yes, small and Asian does take the danger level up a bit. heheh. and i’m not sure if a raptor-nail can be shaped and forged if it’s not already in the DNA. i’ll have to consult with Mombot on this one and get back to you. You are not seriously capable of eating like that, are you? If I tried it the contents of a spoon would end up anywhere but my mouth. OMG! My husband used to call me Monkey Toes! I used to be able to pick stuff up off the floor with my toes. And what the nieces used to call “Squinkering” with my toes. When you squinker someone…you pinch them with your toes on the fleshy parts of the muscles! Funny, my husband and I call each other Monkey Toes! I actually do use my feet as extra hands when I’m crafting or need to get something. Bend? Heck no, I’ll just grab it with my foot! so did you lose your monkey toes, Pixie? i’m still pretty good at picking stuff up with mine and i can definitely “squinker,” but my mom takes it to a whole nuther level. if she pinches you, you’ll be sore for days, if not weeks since her toes are like little vice grips. and she’ll draw blood if you don’t immediately jump away. my sisters and i learned to stay out of pinching distance at a very young age. Haha, the “Squinkering” skill is great Pixie, I’m going to have to try that one! I thought my family was the only with monkey toes! I could attest to that. We asians are a tough lot. But I still can’t figure out how to use my feet for anything but walking. I have pretty good grabby-toes, myself. Though, they used to be able to grab a lot more things than they can these days. Maybe I’ve stubbed them too many times, ahahah. I think one of my greatest recent feats (pun possibly intended) was when I was living with my cousin’s family. I brought up three and a half plates (one was small for a child) of pasta. I gave one to each the kid and his dad in the living room, but the mom was with her other kid in their bedroom. So, still holding two plates, I opened the door with my foot. you can lose the dexterity of your “grabby toes” if you don’t work them out regularly, Aelyrin! although stubbing them often can have an adverse effect, too. heheh. Jurassic Park is frightening in the dark! All the dinosaurs are running wild!!!! *cough* er uh ahem. Sorry about that. I think I was channeling Weird Al or something. Beware the deadly toe slashes of Mombot!! it’s easy to channel Weird Al when thinking of Jurassic Park, TCG – i love the claymation video for that song! all kinds of awesome. Ha! You may be bred of Japanese blood, and I Chinese, but I think there must have been some serious cross-sea breeding going on between our ancestors, because you and I share the same monkey toes. I also inherited mine from my mom who had a lethal toenail! We are brothers in many ways, Jeff. On another note, it would be very interesting if you could do a strip of her doing that. true, since she’s Asian, she definitely knows kung fu or karate! if nothing else, i know she’s done Tai chi, which is just a secret way for people to practice martial arts under the guise of exercise. and you can bet that we’ll see Mombot’s raptor toe in action sometime soon! And yeah…I mean, why go all the way down for something when you could use your feet :D! you might just get your wish, nicobot! And if Mombot is really that foot deadly then my respect for her has grown several notches up. Meh (of doom, of course). It’s been raining SO much here in Puerto Rico for this past month that I’ve been freezing all over and barelly able to leave my bed of doom. Lungs start acting funny and mom clearly told them (my lungs. She likes to talk to my body parts. Freaky!) that they better keep working or else. Not sure if I wanna find out what the “else” entiles. And yes, Michael’s right. Jeffbot having monkey toes IS GROSS!! (I sort of accept the whole game controller thingy… but EATING?!! Hell NO!!!! GROSS!!!! My guess is that the “else” part refers to robotic replacements. “she’s so cute and asian” is definitely something Michael would say in Real Life, Sonitan, (which he probably has, actually) so i’m glad that tickled you. and yes, Mombot’s feet really are that deadly. pretty much no hyperbole in jefbot’s description in the strip. Hilarious! …and Jurassic Park is my favorite!!! MONKEY TOES! thanks, Funnyshaffer! yep, Jurassic Park = awesome. I knew that was familiar, did you need to scare the poor kid doc? Why didn’t you just pull a gun on him. Mombot doesnt come at you from the front but from the sides with other mombots right? and its retractable too I bet. Even before cornfather said the jurrasic park I read that in sam neils voice. LOVE that movie! You picked a great line to quote too lol. Think I’m gonna watch that when I get home, I even have it on VHS if you can believe it. Lost world too. i still have my (well-worn) VHS copy, too! but i’m waiting for the inevitable blu-ray release, of course. kind of mystifying that isn’t out, yet. so was this kid that sliced you with his toenail Asian? glad you could relate, Eptha! i attribute my mom’s deadlier feet to her days climbing banyan trees barefoot and such in Hawaii during her youth. i think with a little training, my feet could be just as lethal! My mom isn’t lethal with her toes…but she does have weird ones…they’re hobbit ugly (not hairy, just broad and flat) and she can like totally pick anything and everything up with them. Her toes flex like fingers, it’s weird..I try not to look at her toes directly…they creep me out…ha! Yeah, she’s lethal in other ways, and Mexican…spicy little spitfire, she is…. my dad’s feet are more hobbit-ish than my mom’s ESQ – more broad and flat like you’re describing, but with nubby toes that don’t have a lot of dexterity to them. my sister (Lor) inherited those and she has the tiniest, cutest pinky toes that have no lethality to them whatsoever. If I could do stuff like that with my feet, it’d be like having the extra arm I don’t have. 😀 This also reminds me of a Ripliey’s Believe it or not episode where a guy in India (I think) who is able to wright with both hands and feet at the same time and in several different languages. wow! this dude could write with both hands and feet at the same time in different languages!? that’s truly amazing, and puts my mom’s and my feet to shame, Fijiman. heheh. congrats to your brother for the plays and to you for the techie award! sweet! Thanks. I’m sure that if you looked hard enough on their site you could probably find him, but I’m to lazy to do it. true dat, Aki! nimble toes come in very handy when doing laundry! and funny, my toenails (and fingernails for that matter) grow very fast, so i could probably make a raptor nail of my own in no time. i just don’t think it would grow as hard and dense as Mombot’s do. and i can’t even imagine stepping on one of her cast offs – eternal pain, indeed! when you see the ripples in your cup, do you run for the bathroom stall or do you stay in the car, BrittyKitty? at least you didn’t have to wait as long for updates, Jaeh! and hey, glad you’re back! and what’s a “Jurassic Park-Pinocchio”? like, a T-Rex puppet or something? i’m almost afraid to ask since it already sounds scary. A funny coincidence: on Thursday night, while you were drawing this strip, I was at a silent movie called “The Unknown” where Lon Chaney played an armless circus performer who did everything with his feet… eat, smoke cigarettes, throw knives… maybe a new career trajectory for you? maybe, Kim! depends on how much money’s in it. heheh. if i could play videogames all day with my feet and get paid a decent wage, i’m in! I think anyone who could get a job like that would be set. Being able to do it with your feet would just be a bonus.